This was on Oct. 6th; I was drawn to this word that I had printed out back in 2017 from Prophet Fiorella Giordano and it was about “9’s” so knowing that this is the New Jewish New Year of 5779 that began in Sept. this year, I just pressed on to know more. Right away I saw/heard; “The Honorable Justice Brett Kavanaugh” being confirmed in Heaven, like it was happening right then; and really it was. God’s plan, His way, His Justice and His Samuel (which Prophet Charlie Champ saw), in the Supreme Court to make way for the rest that God wants sitting there…His….Deborah; 2nd… and 3 more to come I have heard. So, I went for my walk this morning as I usually do and I decreed what I saw as Father’s “9” timing for 2018==>>5779 Jewish Calendar. I took that whole paper that I had printed out last year and made those proclamations into the 2nd heaven—wow! It was so clear to me! It’s favor, purpose and anointing that she spoke of only it is NOW! The Remnant Warriors in the body of Christ have come together in the Spirit and in prayer waves world-wide. This is a new thing in the Spirit realm and it’s powerful!!! God loves it! It’s in the power of His love and devils are raging, especially Leviathan, Jezzie and Haman spirits…..the so-called gods are shaking and quaking (as Prophet Mark Taylor has already said they would), and they haven’t done this since Jesus stripped their leader in hell of all authority, power and dominion he thought he had and took the keys of death, hell, and the grave! Whoopee!!! (my hand was shaking as I wrote this) The children of the Most High God have won!!! We will win even more! There is such a knowing in my spirit. After this I saw another post on fb from Brother Mike Thompson about the Warriors of the Lion of the Tribe of Judah and it really confirmed this experience/encounter (I’m not sure what it is), and the Warriors were saying to the hordes of hell—WE WON!!! or—-WE WIN!! !…one of those. Anyway, this was powerful and I shared it with my friend Laura and she concurred. It is always wise to check these things out with a more experienced prophetic Sister or Brother. I learned this when I was under Christian International with Prophet Barbara Jackson, to have your words, experiences/encounters, etc. tested by others, and Prophet Jennifer LeClaire teaches this as well. 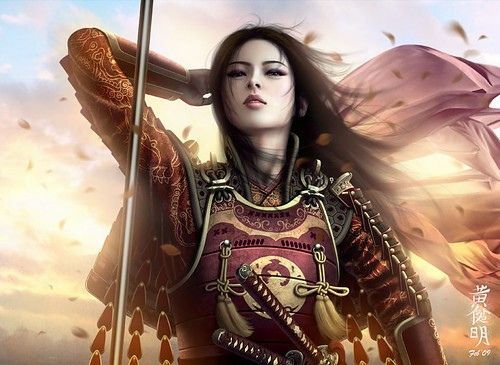 Best Picture of a Woman Warrior (images on Google) that I could find. It is how I see myself…….only with Red hair…..LOL! Keep checking my site Maria, I just posted again today. Thank you for your comments; wow! That goes even deeper than I thought. I didn’t make that connection, so interesting and really really good. In light of everything out there; Q and the Praying Medic, etc. It is amazing! Thanks for your comments; yes, my read hair definitely would look better!!! LOL! Previous Previous post: Joy in the Father’s Love!